A tension between absence and presence hovers over Bronlyn Jones’s quiet works Untitled #3 and Erasure List, both from 2009. In their spare intimacy, both sheets invoke things unseen just as they inspire painstaking examination of their subtly worked surfaces. 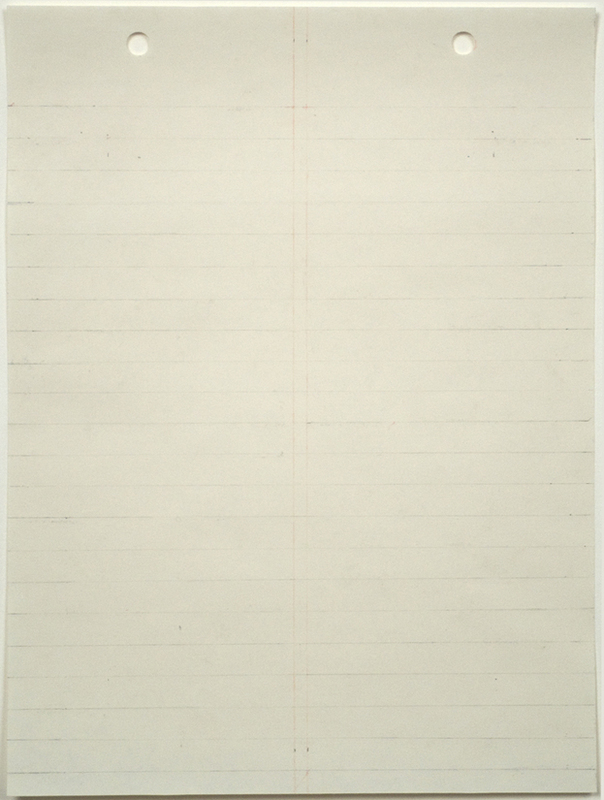 While her depiction of everyday materials and use of text appeal to the spirit of conceptual art, Jones operates in a register of meticulous craft and aesthetic restraint that summons comparisons with minimalist precedents such as Agnes Martin and contemporary artist Wes Mills. Beginning with specially selected butcher paper, Jones carefully delineates the sheets with graphite and red pencil until they resemble neatly lined, though gently aged, notebook pages. For the series “Drafts of an Empty Page,” these lines complete the exercise. While Untitled #3 is an early, anonymous example, more recent works in the series depict the grids and proportions specific to varied typologies of the notebook: Moleskin, Reporter’s, Ledger Page, Writing Tablet. They are essentially portraits of writing’s basic substrate, almost reverent in their precision and ostensible blankness. Yet it seems important to emphasize that, due to Jones’s manual process, we are far from the territory of the readymade. In Jones’s own words, it is the “subtle nuances, texture, evidence of the hand,”1 which constitute the works’ essential features. 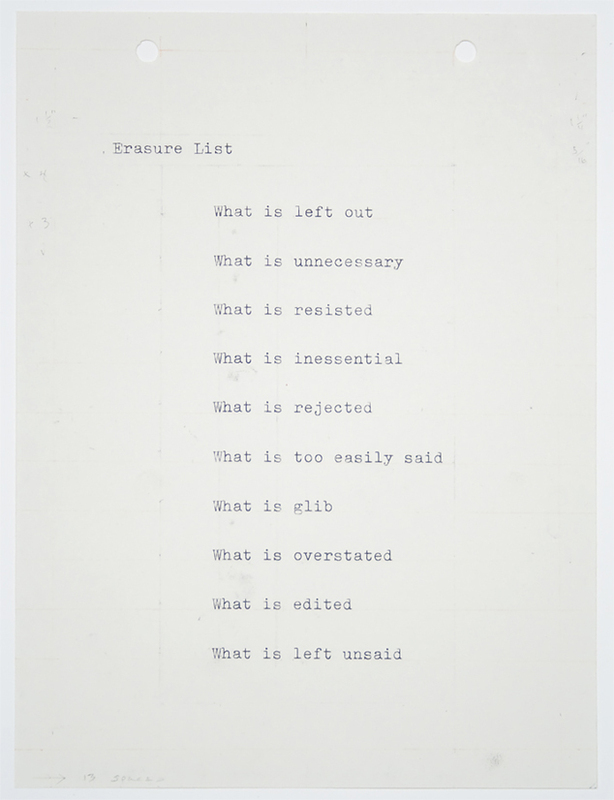 Erasure List bears typewritten traces of the artist’s thoughts and touch, though the negative imagery speaks more to that which is omitted than to what is included. The empty line between each fragmentary phrase visually conjures the erasures to which the title refers. This structural gesture recalls the ‘intermedia’ strategies especially favored by Fluxus artists of the 1960s and 70s, which blurred the distinction between visual arts and poetry. The repeated words What is anchor each line and form a vertical chain down which the eye easily slips. But this poetic offering is not an abstract image. The statements flicker between questions and dictums, constructed either around the deficiency or the banishment of words, images, or processes. We, the viewers, are faced with the inevitable desire to fill in the blanks, but we are not necessarily equipped with the tools to do so. Faced with this incompleteness, or staring down an empty page, we approach a state that the poet John Keats called negative capability: “when man is capable of being in uncertainties, Mysteries, doubts without any irritable reaching after fact and reason…”2 Jones volunteers no answers. The list feels both deeply personal and universally germane. 1. Bronlyn Jones, unpublished artist’s statement. 2. John Keats, letter to George and Tom Keats, 21 December 1817, accessed 19 July 2011, http://www.mrbauld.com/negcap.html. Bronlyn Jones (b. 1954, Iowa) received her BFA from the School of the Museum of Fine Arts, Boston, and Tufts University, Medford, Massachusetts (1983). She completed her MFA at Tyler School of Art and Temple University, Philadelphia (1985). Jones was the recipient of a fellowship from the Massachusetts Cultural Council and the New England Foundation for the Arts in 1995. Jones’s work has been included in group exhibitions at such venues as the Reed Fine Art Gallery, University of Maine, Presque Isle (2009); the Museo de Arte Contemporáneo Esteban Vicente, Segovia, Spain (2009); the Barbara Krakow Gallery, Boston (2009, 2012); the Joel and Lila Harnett Museum of Art, University of Richmond, Virginia (2011); the Zimmerli Art Museum at Rutgers University, New Brunswick, New Jersey (2012); RISDI Museum, Providence, RI (2013); and Barbara Krakow Gallery, Boston, MA (2014). Jones lives and works in Little Compton, Rhode Island. Ingrid Langston (b. 1983, Seattle, WA) received her MA from the Institute of Fine Arts at New York University. She is currently a curatorial assistant in the Department of Drawings and Prints at The Museum of Modern Art, New York. Bronlyn Jones, unpublished artist’s statement. John Keats, letter to George and Tom Keats, 21 December 1817, accessed 19 July 2011, http://www.mrbauld.com/negcap.html.